Don't Let Your Computer Push You Around . . . .
Let me make you the boss of your computer rather than the other way around. Your computer should always do what you want it to do - when and how you want it done. I'll keep you and your computer safe and secure from hackers, spammers, viruses, as well as all sorts of other malicious intruders - and running smoothly at top capacity. 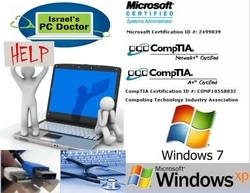 Available to Israel's PC Doctor Customers at Deeply Discounted Rates. to Catastrophic Event Rescue, Restoration, Resolution,Recovery & Repair. Got Computer or Internet Questions? Call Now for FREE Advice or Consultations!! "Beau conducts his business like he lives his life, with determination, focus, integrity and hard work. I can't imagine being in more competent hands than his. Truly a visionary! "